It's April, which means that it is the month of a new release of Ubuntu. Hardy Heron (8.04) is going to be the eighth release of the distribution, which has enjoyed enormous popularity in recent times. I use the KDE variant, Kubuntu as one of my main desktop operating systems, but I haven't yet tried out the beta of Hardy Heron. I'm putting the standard Ubuntu desktop disc through its paces. The first thing you notice after booting off the CD is that the boot menu has new options. Instead of just booting into the live CD environment only, you now have the option to boot in and 'Try without change', or to jump straight into the installer. In the normal mode, it boots fairly quickly, considering it's a live CD and you can get up and running straight away and play with all the default applications as much as you like. If you do then decide after a quick play to install, you can use the Installer icon on the desktop, just like previous versions of the Ubuntu Live environment. Hardy features some visual changes from its predecessor. The GNOME theme has been subtly altered - menus now have an orange coloured bar on their left and some gradients and colours on buttons and other core widgets have been slightly changed too. There is also a new default desktop background, which features an artistic rendering of a heron in the Ubuntu colour scheme. I personally think it looks professional and makes a nice backdrop to the new distro. Going over to your other option on the boot menu now, choosing the install-only mode is slightly quicker, but really only cuts out the extra time it takes to load the desktop and double-click the icon. The installer is very much like its predecessor. It is reasonably simple to understand, minus the usual, unavoidable confusion that partitioning will cause. I managed to do a full install on the disk easy and quickly, and had no issues with the installer that has happened on occasion in previous Ubuntu releases. Stability is a big issue here - Hardy Heron is planned to be the second release of Ubuntu given the Long Time Support (LTS) moniker, which means it will be officially supported for three years on the desktop, and five on the server. I didn't experience any major issues in my brief play, although one application I did launch crashed (it was the Screens and Graphics control panel application listed under Other). 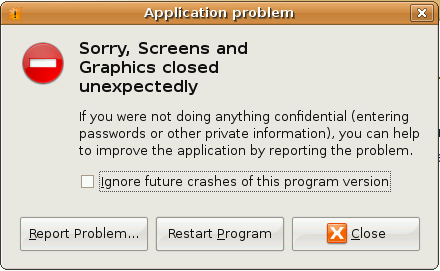 The fact that it crashed was handled with admirable grace, with a balloon popup appearing in the top right of the screen. Clicking the icon gives a dialogue with some more information. Also, the wired network connection that was available to Ubuntu didn't work straight out of the box. Granted that enabling it is simply a matter of clicking the network icon in the top right and clicking Wired Network, but in my opinion this should have been automatic and not required any user input at all. From the brief look I've had, Hardy Heron looks very promising. There are plenty of changes to the architecture underneath the distro that bring it up to date with some of the developments in other distributions (PulseAudio, for example), but the experience from the user's point of view remains one of the best and easiest of any Linux distribution available. If you want to have a play around with the Hardy Heron beta, you can download it from the Ubuntu site.